The welcoming standard room of Bannisters Pavilion in Mollymook, NSW (photo: Justin Alexander). 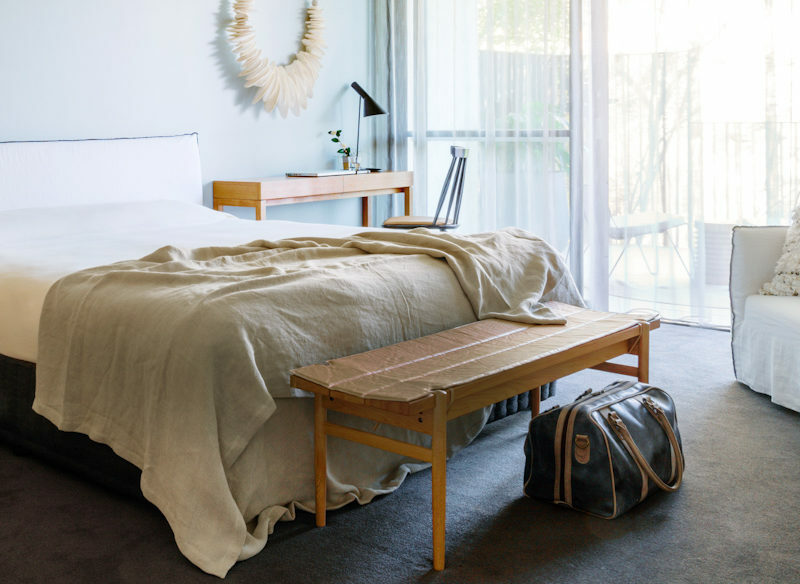 It’s a precarious proposition, being the newest family member of Australian hotel royalty; Nikki Wallman checks in to see if you can have too much of a good thing. Bannisters Pavilion launched in late 2015 as the younger sibling to Bannisters by the Sea, a south coast stalwart long renowned for its classic Australian coastal luxury. Both are situated in the popular enclave of Mollymook, a vanilla-milkshake-in-a-tin-cup kinda beach town, where the days are long and lazy. Arriving to check out the new digs, my husband and I are curious: is there room for another Bannisters? What can it add that the original doesn’t already deliver? The new boutique hotel is a beacon of modern, coastal cool: from the clean, curved lines of the exterior; to its airy, comfy interiors (think Nordic-meets-modern-Australian with lots of white, accents of blond wood and lush greenery in the atrium-like lobby); and especially on its signature rooftop bar-pool-restaurant area, which evokes the likes of Sydney’s entertainment complex Ivy, but on a more intimate scale and without the attitude. The hotel is nestled long and low, into a welcoming hug of eucalyptus, succulents and palm trees, set back off the main beach but within easy walking distance (and boasting ocean views from the rooftop). Our welcome at reception is genuinely warm; with just 32 rooms and two penthouse suites, a laid-back atmosphere pervades. The styling of the Bannisters Pavilion rooms are cosy and chic. Mollymook, NSW (photo: Justin Alexander). We drop our bags in our room, which is spacious and calming with crisp white linens, deep charcoal accents and tasselled wall-hangings. The bathroom boasts heated towel racks, a large shower and Appelles amenities. We head straight up to the rooftop for a late lunch: a bloody good burger topped with bacon, cheese and beetroot, washed down with rosé. Soaking up the sunshine in a hanging egg chair, we ogle the suspended pool that overhangs the entrance below. The different areas – pool, bar, dining – are seamlessly arranged and boast a sophisticated, beachy vibe. It’s a virtual seaside playground for grown-ups. A quick nap in our supremely comfy bed and we’re back up to the rooftop – now positively buzzing with what looks like a mixture of locals and guests – for a Young Henrys lager on tap, before dinner up the road at Rick Stein at Bannisters (free transfers are included; a nice ‘family’ touch). A generous, fresh breakfast the next morning is followed by a dip in the pool before checking out the local markets and heading home. Begrudgingly. Refreshing cocktail from Bannisters Pavilion rooftop bar. Mollymook, NSW (photo: Justin Alexander). Turns out Bannisters Pavilion is the Prince Harry to Bannisters by the Sea’s William: playful, cool, devilishly handsome, and arguably prone to later nights. There’s room for both in this royal family. Verdict: Bannisters Pavilion manages to up the ante on the south coast drinking and dining scene without betraying the area’s unpretentious nature. We rated: The rooftop pool, bar and grill melds big-city-cool with coastal chill. We’d change: Alcohol in the bar fridge could come in handy for when you’re too relaxed to even head to the rooftop bar. Notes: We paid $270 for one night (although there’s a two-night minimum stay on weekends) in a standard room, including breakfast.